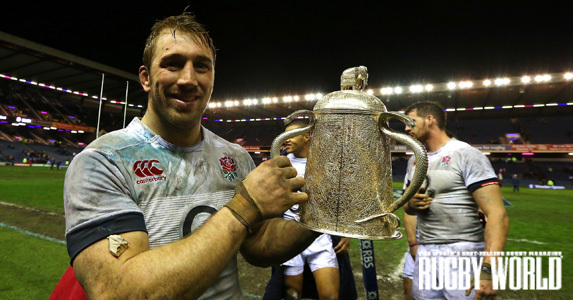 Up for the Cup: Robshaw and his cohorts took the Calcutta, but will they kick on against Ireland in Round 3? This could and should have been a far more difficult obstacle for England to negotiate. Wet weather, a notoriously stodgy surface and Murrayfield’s raw hostility were meant to unsettle Stuart Lancaster’s intrepid but inexperienced charges – at least enough to make things competitive. As it was, a 20-0 defeat actually flattered Scotland. Besides a couple of Dave Denton charges and some valiant scramble defence, the home crowd had precious little to rally behind. In a game that was painfully dour at times, England’s triumph was never in serious doubt. Still, some valuable pointers emerged. In-form Ireland arrive at Twickenham on February 22. England must be on the money. Winning ugly is a valuable trait that Lancaster has instilled very effectively. This was the 15th triumph from 24 matches across his two-year tenure to date. Tenacious tackling and mental resilience have rarely gone missing. Keeping Scotland scoreless for the first time in this fixture since 1978 – no mean feat at all – seemed a routine accomplishment. Defensive standards are taken for granted. Now to polish the other side of the coin. As Man of the Match Mike Brown said at the final whistle, England’s emphasis this Six Nations has been on moulding their attack into a world-class operation. Encouragingly, some of the spark we saw in Paris survived in the Edinburgh mud. Cohesion and skills are improving and the lineout has become a launchpad, as Luther Burrell’s try demonstrated. That said, a ruthless edge needs sharpening. At Murrayfield on Saturday, England made ten clean breaks for 20 points. At Twickenham in November, New Zealand made five for 30. Support play and that final pass are major differences between World Cup contenders and champions. A tally of 65 per cent possession and 76 per cent territory in the second half indicates decent game management, but also inadequate finishing. The next step for this exciting team is to be cold and clinical after locating any sign of weakness. Graham Rowntree’s pack was back to somewhere near its best against Scotland and the engine room once more excelled. 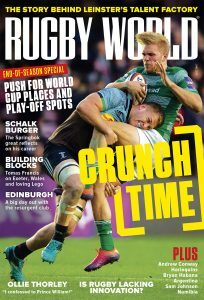 Joe Launchbury and Courtney Lawes complement each other fantastically – the former is a relentless workhorse who careers into upwards of 40 rucks each game, the latter an astounding athlete with a healthy hint of menace. Between them, England’s locks made 15 tackles and a turnover in Edinburgh. Lawes ran the lineout supremely, taking 11 of his team’s 22 throws and stealing two more. The Northampton Saint also found time to rack up ten carries. Second rows often don’t peak until their 30s, so Launchbury (22) and Lawes (24) could easily win 100 caps each and drive England on for the best part of a decade. Dynamic and physically domineering, they embody Rowntree’s vision for a versatile set of forwards that is both brawny and try-scoring. Alongside South Africans Eben Etzebeth and Pieter-Steph du Toit and Kiwis Brodie Retallick and Sam Whitelock, this duo rank among the very best prospects on the planet. That is no exaggeration. Having steadily laid down foundations since 2012 – cooperative culture, a solid set piece and iron self-discipline – Lancaster now has 18 months to hone finer points ahead of a home World Cup. One such aspect, which can transform England from plucky pretenders to genuine contenders in 2015, is potency with ball in hand. Structures and collective understanding form a big part of this. However, Lancaster also knows the power of unpredictability. A “something from nothing player” is his term for the talent to conjure a piece of brilliance from outside the box. Injured Christian Wade is the archetype, but Jonny May and Jack Nowell are not far behind at all. May was a constant threat this weekend, stepping and spinning to bamboozle Scottish tacklers with running lines far removed from any coaching manual. Nowell had to graft, but ignited a dull period with an explosive step, brushing off Matt Scott to set up Brown’s score. Confidence in maverick ability is extremely un-English. It’s great that Lancaster is breaking that mould. In Paris, Yannick Nyanga turned out the sort of performance that compels punters to spout garbage about how Chris Robshaw is not an international openside. France’s industry on the deck – forcing a few turnovers as support got detached from the carrier – could have been a factor in Scott Johnson handing Chris Fusaro a first cap. Perhaps Scotland thought their England’s ruck-work would be a glaring weakness. It wasn’t. It isn’t. Fusaro did make a very commendable debut and was the game’s top tackler with 16. However, he was not able to influence the breakdown as irritatingly well as he does for Glasgow Warriors. Robshaw and Tom Wood were good around the park and though there were a couple of penalties as England fell off their feet while clearing out, they will welcome Ireland – and their phenomenal jackalling – feeling buoyant. Chris Henry and Peter O’Mahony are nuisance geniuses. They need to be nullified at Twickenham. A little faith can go a long way. When Danny Care was cast out of the England set-up 24 months ago after a drink-driving offence, many coaches would have lost patience. Luckily for the Harlequin, Lancaster knows him inside out and must have had an inkling that exile would have made him hungrier. Now 27 and into his second-wind as a number nine – relying on speed of thought and tactical awareness rather than just lightning pace and impulse – Care has turned out consecutive performances that make you wonder how England ever did without him. Another drop-goal at Murrayfield was superbly audacious, but the weight of box-kicking – most of them contestable for his chasing wingers – was much improved. A running threat will always be there, as evidenced by the direction of Duncan Weir’s shoulders before Burrell’s try, but a new-found maturity is coming. As at lock and full back, England are blessed with scrum-half options. Care had always been considered more skilful than Ben Youngs and Lee Dickson, but less rounded. Those days are over.